Running for up to 60 days on Low mode, the rugged 60-Day DURO LED Lantern features an impact and water resistant rubberized plastic housing, an unbreakable lifetime LED, and bright white lighting that’s great for camping, hunting, RVs, and more. The 60-DAY Duro’s removable globe has an integrated handle, and the lantern base includes a built-in recessed hook for hanging as a downlight. 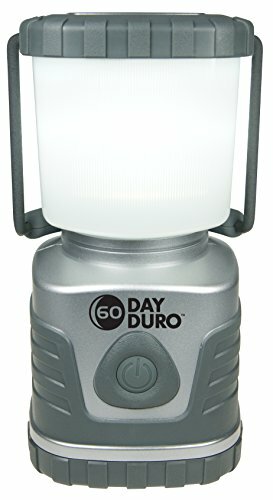 The 60-Day DURO LED Lantern also includes an SOS flashing emergency strobe that lasts for up to 15 days.